I’m currently reading an extraordinary book, called ‘Endgame’, by Derrick Jensen. Jensen paints a very bleak picture of the world, and I’m not sure that I’d recommend it, unless your optimism is of a very robust nature. He’s certainly no fan of multinational corporations, so it’s ironic that a chapter in the book made me think that Nike have the greatest advertising slogan ever. It also made me think that the iconic poster of the first Obama presidential campaign was, unpredictably perhaps, strangely anticipating what seems to have been widely regarded as a disappointing presidency. If we hope for a better life/body/world etc. it is as though we pass the mantle of responsibility for that betterment on to someone else, perhaps ‘someone’ supernatural, if we are hoping that God will make things better. In taking action we can claim responsibility for our future, and have a real chance to shape it the way that we would wish it to be. 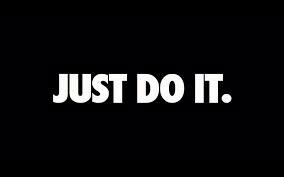 Perhaps President Obama would have done better to borrow Nike’s slogan for his election campaign – maybe that would have given his presidency a little more momentum. Get out of the raft, and swim. Just Do It. These slogans reach from a vast arena – one too great for any mind engaged in the matters of a day to day life to fully understand that is made up of so many people and institutions that is seems impractical to hold one person solely responsible – to spark some sense of human connection. I don’t think that hope is a cop-out. Rather, I see it as a tool for inspiring action. A lead up, if you will, to just doing it. Because it’s a lot easier to jump into action if you have some idea that the results will be good. I can speak from personal experience, that the level of my motivation is directly related to the level of my overall outlook on life. Keeping tabs on change is a subtle art, especially in an arena so large as the USofA. I mostly go on faith. If, in keeping tabs on the changes in my own life I’m tuned in enough to notice the ever-present movement, I have faith that I am part of a much larger body that is constantly evolving and sometimes I catch wind of what that looks like. That’s enough to keep hope alive in my heart and my days full of action.